Active Components: There are no less than three types of elements, found in bitter melon that can positively influence a body exposed to diabetes, decreasing sugar levels and producing a generally beneficial effect on patient’s blood. It is a well known combination of steroidal saponins, including alkaloids, peptides similar to insulin, and charantin. It’s still not evident which component is the most effective one, or whether they are equal in their effectiveness. The proteins, included in the plant, and known as beta- and alpha- momorcharin, are believed to subdue AIDS; still, the fact is only demonstrated in the laboratories, but not on suffering patients. An unknown but effective component is potent of decreasing guanylate cyclase content, which is essential for psoriasis sufferers. History: Tropical inhabitants applied bitter melon both as a meal, and as a remedy for a wide range of health issues. Several types of infections, leukemia, cancer, diabetes and other are among the diseases which are thought to be cured by the plant. Fruit and leaves are applied as a source for beer and teas, as well as included into soups in the west. Used for: Bitter melon is generally applied as an aid in psoriasis, possible HIV treatment, and diabetes. According to numerous clinical researches on people and animals, green fruit and fresh plant juice are potent of decreasing sugar levels in blood. Charantin’s effect in diabetes is more pronounced than that of tolbutamide, which is also used in decreasing sugar levels in blood. Bitter melon’s mature fruit is known to act positively on patients, suffering from cancer, particularly leukemia. Additional Info: Bitter melon can be met in tropical regions, namely, South America, the Caribbean, Asia, and East Africa, the areas, where people apply it both as a meal, and for medical purposes. 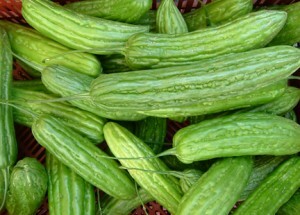 It is very much similar to a cucumber in its appearance. The fruit should be solid and have a bitter taste. Plant’s leaves and seeds are also applied, but it’s safer to consume the fruit, as it unites the herb’s medical and nutritional properties. Preparation and Intake: For people who can bear bitter taste, one middle-sized melon can be consumed as a meal. You may alternatively use fresh juice in a quantity of 50 ml a day. Additionally, if you are indifferent to bitter tastes, you may use tincture made of the plant extract in a quantity of 5 ml thrice a day. Safety: Bitter melon, taken in large quantities, can lead to diarrhea and stomachaches. Children of early age and people who suffer from hypoglycemia (decreased sugar levels in blood), should avoid using bitter melon, due to its capacity to lower sugar levels in blood. Moreover, patients who use medicines lowering sugar levels in blood (like phenformin, glyburide, and chlorproramide) or insulin to treat diabetes, should not compare them with bitter melon, as it may increase their effect and result in abnormally low sugar levels.